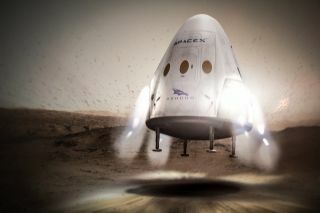 SpaceX Dragon makes use of Supersonic Retro-Propulsion (SRP) to land on Mars. Elon Musk and his SpaceX rocketeers are blueprinting a plan to land humans on Mars in 2025 and to land payloads onto the Red Planet's surface at each 26 month opportunity starting in 2018. A similar timeline may be pursued by other players. The report, now in draft form, is called "Essential Precursor Activities for a Near-Term Human Mars Mission." It is the output from an independent virtual panel of researchers sponsored by Ceres Robotics of Montara, California. The exercise had neither encouragement nor approval from SpaceX nor NASA. The initiative was led by Michael Sims, leader of Ceres Robotics and a Mars Exploration Rover co-investigator. In its pages, the draft report underscores the fact that there are a number of "clear and pressing issues that need to be addressed as soon as possible." Christopher McKay (NASA Ames); Carol Stoker (NASA Ames); Margaret Race (SETI Institute); Andrew Schuerger (University of Florida); Penelope Boston (NASA Astrobiology Institute); Pascal Lee (NASA Ames; SETI Institute; Mars Institute); Charles Cockell (University of Edinburgh); and Michael Sims (moderator) from Ceres Robotics; Mars Institute. "There is a great deal that needs to be tested and evaluated on the Mars surface on very tight timelines to be properly prepared for a near-term Mars mission. Clearly a mission within a decade can be considered near-term although even a considerably later mission will require expedience and a focused effort," the report notes. Availability of resources useful for human activities including life sustaining materials. In terms of the search for life on the Red Planet, the report explains that it will not be possible to fully demonstrate the absence of life on all of Mars in any near-term basis "unless we find overwhelming evidence of its existence." Furthermore, scouring the planet widely in this search is likely to be a slow process, the report adds. "This is probably the highest scientific goal for Mars exploration in the long term and it is reasonable for this science exploration be concurrently with the expansion of human presence on Mars. However, unlike the Moon, Mars does theoretically have many possible niches for life and hence as we continue the exploration of Mars we must also continue the search for extant Mars life far into the future." If possible, land all future precursor missions to the single site of human landing. In addition to the value to future explorers of landed resources at this site, this also gives the best chance of evaluation of the local toxicities and a search for any extant Mars organisms at that site. There are no tricorders for life – even on Earth, but especially for life that might have a distinct genesis. We need to exercise a number of different instruments on the Mars surface to look for indications of extant life at the landing site. Those instruments need to be applied at a number of areas (niches) around any landing site. Confidence will grow in our outcome as the number of tests and sites increase. Although after 40 years we now believe we understand the Viking life on Mars experiment results, we need to be prepared for future surprises and uncertainties to come with our experiments. This leads to a preferred strategy to treat these life-detection instruments as an ongoing development (across precursor and human missions) of more refined instrumentation in search of indicators of extant life. Until we understand the extent of extant life on Mars (if it exists at all) then one reasonable approach is to exercising a zoned approach to planetary protection. We need to characterize the chemistry and especially toxicity of the surface and near subsurface materials at the landing site. We also need to demonstrate techniques for mitigation of those toxicities that are compatible with human crew use and safety. Resource needs for the crew and minimizing the burden of keeping a crew safe are parameters to be evaluated in the base site selection. If the case can be closed on pumping water and oxygen and other trace gases out of the atmosphere then that approach has the advantage of ease of crewed operations and relative location independence of the base landing site.